Shop for ₹1500 or more and take 5% discount. Maximum discount available is ₹1000. Offer cannot be clubbed with any other existing offers. Availed only Ramdev and baby food. 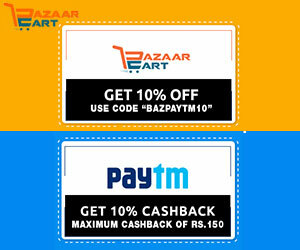 Just download the BazaarCart App and get 10% discount on your shopping. Make minimum purchase of ₹1499 to avail the benefit. Get maximum discount of ₹1000. Offer valid only once per user. Excludes Ramdev Patanjali and Baby Food. Buy now and get flat 10% + 2% cashback at Bazaarcart. Apply the coupon code and get the discount. This offer is applicable on the products displayed on the landing page. Shop for ₹1000 or more and get 5% discount on your purchase. Take maximum discount of ₹1000. Offer cannot be clubbed with any other existing offers. Only Ramdev Patanjali and Baby Food. Shop products from various categories such as digestive items, churna, chyawanprash, balm and ointment, biscuits and namkeens, eye care products and more and get 10% discount. Shop for minimum of ₹999 to enjoy the discount. Get maximum discount of ₹100. Pay for your shopping bill using mobikwik wallet and receive 10% discount on your order. Minimum transaction value should be ₹999. Maximum cashback eligible is ₹100. Enjoy flat 10% discount on minimum transaction of ₹999 when you download Bazaar Cart App. Valid only once per customer. Valid till May 31, 2106. Use code and get 10% discount on all products excludes Ramdev Patanjali products. Plus 20% cashback on every purchase. Maximum discount of ₹1000. Applicable on minimum transaction value of ₹1,499. Offer valid only once per user. Use voucher code and get 5% discount on grocery, personal care, home and other products. Plus extra 7% cashback on across the website. Get Refreshed this Summer - Avail flat 30% discount on Rehan Sharbat from Bazaar Cart. Use voucher code to get extra 5% discount. Get upto 65% off on home care products. Buy quality home care & utilities detergents, kitchen needs, air fresheners & more. Extra 10% discount on minimum transaction value of Rs.999. Maximum discount of Rs.500 can be availed. Earn 2% cashback on every purchase. Shop now! Get upto 50% off on books & novels. Get extra 10% off plus earn 2% cashback on every purchase. Maximum discount of Rs.500 can be availed. Applicable on minimum transaction value of Rs.999. Get extra 10% off plus earn 2% cashback on every purchase. Maximum discount of Rs.500 can be availed. Applicable on minimum transaction value of Rs.999. Get upto 50% off on women’s products. You can shop for fashion products, beauty products and others. Extra 10% discount on minimum transaction value of Rs.999. Maximum discount of Rs.500 can be availed. Earn 2% cashback on every purchase. Shop now! Pay through Paytm wallet and grab flat 10% discount. Maximum discount of Rs.150 can be availed. Valid for new users. Applicable on minimum purchase of Rs.2499 or above. Spend Rs. 499 or more at Bazaar cart and take 15% discount on your order. Simply apply the promo code at time of checkout and get the benefit. Grab 15% discount on all products. Applicable on minimum purchase of Rs.499. Use voucher code during checkout. Grab 10% discount on all products by using the voucher code. Applicable on minimum purchase of Rs.2,499. Valid for new users. Use voucher code and get 10% discount with a maximum discount of Rs.500 + 2% Wallet Credits. Applicable on minimum purchase value Rs.2499. Valid till 10th March, 2016.